Slawek Tulaczyk has been studying the West Antarctic ice sheet for more than a decade. Photo by Nadine Quintana Krupinski for the Ice Stories project, (c) Exploratorium. UC Santa Cruz researchers are among the leaders of a major Antarctic research project in which scientists will drill through a half-mile of ice to penetrate subglacial Lake Whillans and study hidden processes that govern the dynamics of the West Antarctic ice sheet. The Whillans Ice Stream Subglacial Access Research Drilling (WISSARD) project, funded by a $10 million grant from the National Science Foundation (NSF), will examine subglacial environments in Antarctica, including what may be the last unexplored aquatic environments on Earth. The project's multidisciplinary team of researchers from nine U.S. institutions includes Slawek Tulaczyk and Andrew Fisher, both professors of Earth and planetary sciences at UCSC. Tulaczyk, a glaciologist who has been studying the West Antarctic ice sheet for more than a decade, is one of three co-leaders who will oversee different parts of the complex project. 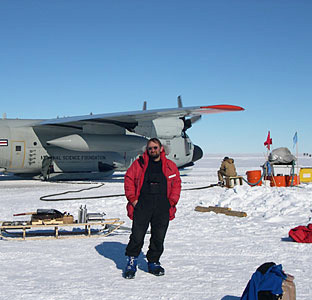 In 2002, he organized a workshop at UCSC to explore the technologies needed to drill through the Antarctic ice sheet. "If you want to understand how fast the ice moves and how it contributes to sea level changes, you have to understand how subglacial lakes influence that motion," Tulaczyk said. Estimates for the rise in sea level that would result from a complete collapse of the West Antarctic ice sheet (WAIS) range from 10 to 16 feet. The WAIS is considered less stable than the larger East Antarctic ice sheet because much of it rests below sea level, making it more susceptible to melting by warm ocean currents and rapid calving of icebergs. Coursing through the ice sheet are fast-moving sections called ice streams. "They are just like rivers of ice," Tulaczyk said. "The contribution of ice to sea level is dependent on the difference between how much snow is coming into the ice sheet and how much ice is coming out. How fast the ice streams move and whether their velocity can change is important to understanding how fast sea level will rise." Liquid water at the base of the ice streams is thought to be a key factor controlling their movement. Research by Tulaczyk and others has revealed networks of subglacial lakes beneath the ice that may have substantial effects on the dynamics of the ice sheets. How the lakes form beneath a half-mile of ice remains a mystery, but scientists believe that geothermal energy plays a critical role, heating the ice from below. According to Fisher, however, a lack of hard data has hampered efforts to develop predictive models of this process. "After several decades of intense Antarctic study, there have been very few studies of the geothermal energy coming in to the base of the ice," he said. Subglacial lakes are under extreme pressure from the expanses of ice above. When the pressure in a lake builds high enough, it begins to drain, and water flows to another pocket in the ice where the pressure is lower. Although subglacial lakes may be covered by thousands of feet of ice, these filling and flooding events can be detected on the surface. Tulaczyk and his colleagues have monitored lake activity by measuring the changes in ice sheet elevations with GPS and satellite data. They measured changes in elevation of up to 10 meters (33 feet), which they attributed to movements of subglacial water. With the new NSF funding, Tulaczyk will be able to use new technology to develop a more complete picture of subglacial hydrology. UCSC's share of the grant, provided through the federal economic stimulus package (the American Recovery and Reinvestment Act), is $2.1 million. In the 2012-13 field season, Tulaczyk, as acting WISSARD program leader, will lead a team to the Whillans Ice Stream on the WAIS. There, researchers will drill through more than 2,300 feet of ice to subglacial Lake Whillans. With access to the lake, Tulaczyk and his team will use sensors to measure changes in water pressure and other variables. These measurements will provide details on how often and to what degree the lake fills and floods. The team will record video from within the lake to monitor the activity of the surrounding ice. Researchers will also recover sediment cores to enable reconstruction of the long-term history of Lake Whillans and its effects on the ice stream. For his part, Fisher is modifying a probe initially designed to measure geothermal energy on the ocean floor. The probe will be six to eight feet long and contain a network of sensors. When forced into the sediment below Lake Whillans, the sensors will provide the first detailed measurements of geothermal activity beneath the Antarctic ice sheets. Fisher, who will travel to Antarctica to test the probe in WISSARD's first field season (2010-11), said he hopes these data will help glaciologists create more accurate models of polar melting. "By collecting these measurements, we reduce one more uncertainty in the ice dynamics," he said. "It's an important piece of the puzzle." But WISSARD scientists, who will be the first visitors to Lake Whillans in over a million years, are interested in more than the dynamics of ice and water. Recent research has suggested that subglacial lakes may be home to unique microbial communities. "Even though the life will probably be very simple, it has managed to exist in total isolation from the atmosphere and sunlight for millions of years," Tulaczyk said. The researchers will have to take extra precautions to avoid contaminating the subglacial environment with their equipment, so they are currently designing specialized sterile-drilling equipment. The drill will use hot water to melt through the ice. To eliminate bacterial hitchhikers, the water will first be passed through an ultrathin filter and exposed to lethal doses of ultraviolet light. "That's part of what makes this technologically new and challenging," said Tulaczyk. "We have to be able to open that hole all the way to the bed, but have everything that goes in be very clean." Another component of WISSARD will focus on the boundary between the ice sheet and the ocean. At its margins, the ice sheet extends out over the sea in massive floating ice shelves. Colleagues from Northern Illinois University and New York University will use Tulaczyk's drilling technology to lower a 24-foot-long robotic submarine into the dark waters beneath the Ross Ice Shelf. The robotic submarine will record the first images ever taken of the grounding zone, a critical transition point where the floating ice shelf contacts the seafloor. For the first time, Tulaczyk will have a subglacial view of the Whillans Ice Stream where it feeds into the Ross Ice Shelf. Recordings by the submarine will provide valuable information regarding the ice stream's velocity. The submarine will also measure the processes that are eating away at the base of the WAIS. The WISSARD project will give scientists much needed data for evaluating the stability of the WAIS and making predictions about future changes in sea level. "Important decisions that will have social and economic impacts will be based on this research," Tulaczyk said.